Balmoral, a rural town in western Victoria, is 60 km north of Hamilton. It is situated on the Glenelg River, west of the Grampians. Although now not on a highway or major road, Balmoral was on a track used for travel between Melbourne and Adelaide during the 1840s to 1850s, and it was a convenient place for fording the Glenelg River. (The track also led to Harrow and Edenhope, two other places established early in Victoria). 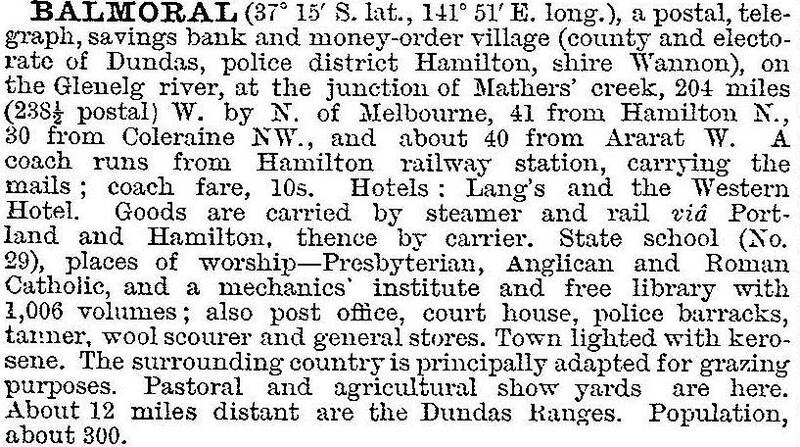 The first white settlement was four pastoral runs (1840-43) which had boundaries converging near Balmoral. An inn was opened near the ford in 1842. The locality was known as Black Swamp (a moist depression 2 km to the north) and the name Balmoral was given when a township was surveyed in 1852. (Balmoral was the name of a Scottish estate acquired by Prince Albert, Queen Victoria’s consort). After World War I there were soldier settlement farm selections (mostly ex-Indian Army officers, few of whom were successful) as sheep grazing properties were slowly subdivided. The railway line running north from Hamilton was extended to Balmoral in 1920, joining the Horsham-Natimuk line. Unfortunately the line was not sturdily constructed and did not carry cereal freights from the Wimmera, greatly reducing its utility. Balmoral however underwent moderate growth and gained a bush nursing centre (1925). Better soldier settlement after World War II, subterranean clover and superphosphate ushered in growth and prosperity. The Rocklands Reservoir (1953), built for the Wimmera water supply, had a temporary work population of about 400. The workers spent leisure time money in Balmoral. The school was enlarged, a swimming pool was opened in 1967, a new nursing centre was opened in 1972 and a high school was opened in 1975. The only loss was sawmilling as the last of the millable timber to the east, near the reservoir, was cut out. The railway line was closed in 1979. Balmoral has an annual pastoral and agricultural show, a community health centre, a K-12 community college (158 pupils in 2014), a hotel, a camping ground, a public hall, swimming, tennis and bowling facilities, a golf course and Anglican, Catholic and Uniting churches. The showground reserve is north of the town and the golf course is 4 km east, towards the Rocklands Reservoir. Several pastoral homesteads survive, and the Englefield and Kongbool buildings (c1842) are heritage registered. The Balmoral court house is also on the Victorian heritage register. In 2005 a widespread bushfire threatened houses and livestock in Balmoral. At the 2011 census, farming accounted for 28.7% of employment.